With our school visits to deliver dinosaur and fossil themed workshops, Everything Dinosaur team members are heavily involved in helping to promote geology/palaeontology and careers in science to young people. We are very aware of the need to promote science to both girls and boys and as we visit a large number of schools we recognise that our team members can make an important contribution. It’s not just our school visits, we supply lots of helpful teaching resources to teachers and home educationalists and provide advice on all sorts of Earth science related subjects from “Anning to Zuniceratops” as our boss, known as “Tyrannosaurus Sue” likes to say. This week alone, we have provided free lesson plan advice to a Year 6 teacher as they prepare to teach evolution as a term topic, supported a Key Stage 2 teaching team with their fossils and rocks scheme of work and answered questions from school leavers about the potential roles and vocations within the umbrella of palaeontology. Fact sheets on Smilodon fatalis and Allosaurus fragilis have been emailed to India and we have supplied Ammonite models to help a geologist explain about life in Jurassic marine environments – all this and it is still only Monday. Dinosaurs and Fossils are Not Just for the Boys! Encouraging women into the Earth Sciences! We have been so lucky to have met and worked with some amazing women scientists. That’s why Everything Dinosaur is delighted to introduce “Lottie the fossil hunter doll” into our extensive product range. We first met Lottie quite a few months ago when she was very much at the prototype stage. We applaud the efforts of those women behind the TrowelBlazers, celebrating the role of women in archaeology, geology and palaeontology who have done amazing work in the past, continue to do so today and will no doubt be at the cutting edge of the Earth Sciences in the future. Our boss Sue, (volcanism is her thing), only wishes that Lottie had been around when she was growing up. As if to affirm Sue’s comments, we received a letter from Shantel in Year 2 after a dinosaur workshop with her class. Shantel was delighted that we came to her school as she was “very excited because we love dinosaurs”. Encouraging girls to learn about fossils and life in the past. Great writing Shantel and thank you for your kind words, we know that Lottie the fossil hunter will be very impressed. Lottie The Fossil Hunter – Girls Rock! Scientists at Tomsk State University (Russia) are busy compiling a technical paper and completing further studies that could affirm fossilised remains found in 2008 are those of a giant titanosaurid dinosaur, very probably a new genus as well. Although titanosaurids are known from most continents, even Antarctica, this, as far as we at Everything Dinosaur are aware, is the first case of a potential Titanosauriform being scientifically described from Russia. The animal lived in the Late Cretaceous, around 100 million years ago (later part of the Albian faunal stage) and its remains which include cervical vertebrae, a partial scapula (shoulder blade) and elements from the sacrum have been painstakingly extracted from sandstone, which much to the chagrin of the research team is from a band of rock that is as hard as concrete. The dinosaur’s bones were discovered in strata, that forms part of an eroded cliff on the banks of the Kiya River, close to the small village of Shestakovo in the Kemerovo region of southern Siberia, around ninety miles south-east of the city of Tomsk. Palaeontologists need a head for heights. The fossil bearing strata is located half way up a ten metre high bank and it is only really accessible during the late spring and summer months. This part of Russia is subject to extremely cold temperatures and a lot of snowfall in the late autumn through to the spring. From the months of October through to March the average daytime temperature rarely rises above freezing. However, August temperatures can exceed thirty degrees Celsius. It is the changing temperatures (freeze/thaw) that lead to erosion of the banks exposing dinosaur fossils. A scientist carefully works away at the rock face. The fossils were originally discovered back in 2008, they had been preserved inside sandstone concretions and although in some cases the fossils were compressed and they represent just a fraction of the skeleton, their location and size indicate that these fossils consist of the remains of a long-necked dinosaur that would be new to science. The rocks around the village of Shestakovo have already yielded a number of dinosaur fossil specimens. Last year, Everything Dinosaur team members reported upon the naming of a new species of Psittacosaurus from fossils found in this locality by scientists working for the Kemerovo regional museum. This part of Russia is famous in palaeontological circles for the preserved remains of another large, prehistoric herbivore but one that is geologically hundreds of times younger than any Late Cretaceous dinosaur. Many fossils of Woolly Mammoths are found in this region, including shed teeth and intact tusks. Some of the fragmentary fossils. The fossils in the picture look like elements from the cervical vertebrae (neck bones). In the background on the right, the posterior end of a large Woolly Mammoth tusk can be seen. The scientists will continue their studies and a scientific paper on this new dinosaur should be published in the near future, as for where the fossils might end up, the researchers have expressed a wish that they should remain within the palaeontological collection of the University, but stress that they could be put on display for members of the public, as well as students to see. As fossil material is being constantly eroded out rocks at this site, the scientists hope to find more fossils of Titanosaurs. In 1995, bones believed to come from the foot of a Titanosaur were also discovered in the same area. At this stage, the researchers cannot say for certain whether these foot bones are from the same animal whose fossils were found in 2008, they can’t even be sure whether or not the foot bones and the 2008 material come from the same genus. Still, it is very likely that more dinosaur fossils are awaiting discovery. The dinosaur has been nick-named Sibirosaurus (lizard from Siberia), but a more formal nomenclature is expected. A close up of one of the fossilised bones. The picture above shows a close up of one of the fossil remains. Although, it is difficult to make out for certain, this fossil might represent a fragment from the sacrum (fused sacral vertebrae). The sandstone rock is extremely hard and this limits the amount of fossil material that can be removed. Use of explosives to bring down large portions of the bank have been ruled out as the force from such an explosion would very likely damage any adjacent fossil material. For the scientists, it is simply a question of allowing natural erosion to do its work, aided and abetted by careful manual excavation whilst hanging onto a rope ladder which dangles several metres down the near vertical bank. Everything Dinosaur acknowledges the role of the Siberian Times in the compilation of this article. Many dinosaur fans may be familiar with the phrase the Age of Dinosaurs. This term represents the time when the Dinosauria were the dominant terrestrial life forms on our planet. This informal measurement of deep time actually covers three geological periods, the Triassic, the Jurassic and the Cretaceous. The first dinosaurs and the Pterosauria (flying reptiles), evolved in the Middle Triassic, although this is only an approximation as the evolutionary history of the Dinosauria and Pterosauria remains controversial due to the paucity of the fossil record. Both these types of vertebrate reptiles rapidly diversified and for the next one hundred and sixty million years these types of creatures dominated the land and the air respectively. For the Pterosaurs, the evolution of the birds (descended from Theropod dinosaurs), led to them being challenged for aerial dominance and as a group, the flying reptiles began to decline in terms of the number of genera and species towards the end of the Cretaceous. Both the Pterosaurs and the Dinosauria went extinct at the end of the Cretaceous. This super, beautifully illustrated A2-sized poster shows how the world changed over the time of the “Age of Dinosaurs”. Three scenes are presented, one for each of the geological periods and dates for the length of these immensely long geological periods are provided. Each prehistoric scene depicts the flora and fauna associated with that particular time period. It provides an excellent, visual guide to the changes to life on Earth during the time of the dinosaurs. There are a total of thirty prehistoric animals illustrated and the poster provides a stunning depiction of prehistoric life. The dinosaur timeline poster has a key to help viewers to identify the animals and the dioramas really help young minds to understand the Triassic, Jurassic and Cretaceous periods and the types of animals and plants that flourished. This colourful dinosaur timeline poster measures 42cm by 59.4cm and it is a really well thought out dinosaur and prehistoric animal poster. In this occasional series, team members at Everything Dinosaur are writing about some of the dinosaurs that appear in the “Jurassic Park” movie franchise. Today, we feature Triceratops, an ever present in our annual survey of the top-ten prehistoric animals and one of the first dinosaurs to be seen in the original Jurassic Park film, which came out in 1993. Triceratops is indeed, one of the most easily recognised and popular of all the Dinosauria . Those three horns (Triceratops means “three horned face”), and the large body make Triceratops very easy to spot. Two species are recognised, the largest being T. horridus, although it is possible that the genus may well be revised again and further species added. In a recent scientific paper the evolutionary development of this genus was traced using fossils extracted from the famous Hell Creek Formation. We at Everything Dinosaur also believe that Triceratops fossil material has also been excavated from Maastrichtian faunal stage deposits in Alberta and Saskatchewan (Canada). A regular in Everything Dinosaur’s annual survey of popular dinosaurs. Triceratops is one of the first dinosaurs to be clearly seen in the original Jurassic Park movie, whilst touring the park in their custom built Jeeps, Dr. Grant’s party spot a downed Triceratops and interrupt the planned itinerary to investigate why this huge herbivore has collapsed. A Sickly Triceratops is Examined Why is She Down? A Triceratops that is not feeling very well. Dr. Ellie Sattler (played by Laura Dern), spots the animal’s dilated pupil when a torch is shone at the eye and in conjunction with the numerous microvesicles (blisters) seen on the tongue, hits upon the notion that the cause of the sick dinosaur is something “pharmacological”. Attending the incapacitated animal is Dr. Gerry Harding, the Park’s chief veterinarian, (played by Gerald R. Molen, who incidentally was also a producer for the film). Dr. Harding explains that these animals fall sick every six weeks or so, but in the film the mysterious illness is never identified. Dr. Sattler suspects that these herbivores may have ingested some poisonous plant material. She looks at the nearby vegetation and spots some fruiting West Indian Lilac (Tetrazygia bicolor). These berries are poisonous, so cue Dr. Sattler to explore a huge pile of “dino dung” up to her armpit to see if the Triceratops had eaten any of these berries. No berries are found and the viewer is left wondering what was the cause of the Triceratops’s regular bout of sickness, in the film this is not explained. In the book the sick dinosaur was a Stegosaurus. In Michael Crichton’s book, upon which the film is based, the sick dinosaur is not a Triceratops at all but a twenty foot long Stegosaurus. In the novel, it is suggested that this Late Jurassic herbivore was inadvertently swallowing berries along with stones to help grind up plant material in its gizzard (gastroliths), we are no experts on the digestive tracts of Ornithischian dinosaurs but when it comes to teeth, the Triceratops, which just happened to have evolved some eighty-eight million years after Stegosaurus stenops lived, wins hands down over Stegosaurus. Stegosaurs may well have swallowed stones to help them grind up their food, after all there were no flowering plants or succulent fruits of the angiosperms to dine on 155 million years ago. Triceratops however, being a Late Cretaceous Ceratopsian possessed a jaw crammed full of square and blocky teeth, a veritable dental battery. What’s more, based on studies of the jaws and muscles surrounding those huge skulls, this dinosaur could probably chew its food. The nine tonne Triceratops may not have needed to swallow stones to help its digestion. Earlier parrot-beaked dinosaurs (Ceratopsia) such as Psittacosaurus did use gastroliths, but as far as we at Everything Dinosaur know, polished stones have not been found in association with Triceratops fossils. So why show a sick Triceratops in the film at all? After all, the book features a Stegosaurus, an equally popular member of the Dinosauria. Michael Crichton is much more forthcoming than Steven Spielberg when it comes to dinosaur poisoning. In the book, the reader is told that the stones the Stegosaurus swallows are very near to the West Indian Lilac plants. As the dinosaur attempts to top up its “stomach stones” every six weeks or so, it accidentally picks up berries as well as small stones and ends up poisoning itself once again. There are no such explanations provided in the movie, although the answer to the Triceratops poisoning mystery is briefly alluded to when Dr. Sattler examines some small stones under a West Indian Lilac bush and holds them in her hand for a moment, but that’s all the viewers get. The film makers had to find a ploy that would enable the tour party to be delayed so that they could build up tension about the approaching storm that was to wreck havoc on the island. A scene in which the poisoning case is reasoned out by Dr. Sattler was cut from the final movie. It gave an opportunity for the cast members to physically interact with one of the amazing dinosaur puppets. It allowed the audience to a learn a little more about the personalities of the characters such as the tenacity of Ellie Sattler, which was important for what was to follow in the rest of the film. It permitted Dr. Ian Malcolm (played by Jeff Goldblum), more time to flirt with Dr. Sattler, helping to build up tensions between three of the main characters. Whatever the reason, the Triceratops scene does pose a conundrum, after all, why replace the Stegosaurus in the book with a Triceratops in the film? Perhaps, a Triceratops puppet was easier to make or looked more realistic. Expect to see Triceratops in the forthcoming “Jurassic World”, which premiers on the 12th June. At the theme park, there is an attraction called “Triceratops Territory”, although we could not find this on the Isla Nublar map. However, baby Triceratops can be stroked and even ridden at the “Gentle Giants Petting Zoo”, we also learn that these horned dinosaurs love getting scratched behind their huge neck frills. You will see panicked Triceratops’s in “Jurassic World”. Triceratops remains a favourite dinosaur. In our surveys, it is liked equally by girls and boys. One of the best selling Triceratops models is the Papo Triceratops, this was joined last year by a replica of a baby Triceratops in the Papo dinosaur model range so young dinosaur fans can play out their own dinosaur petting zoo adventures. Researchers at Harvard Medical School led by genetics professor George Church have combined laboratory grown elephant cells with genetic material retrieved from the frozen remains of Siberian Woolly Mammoths. The genetic material, a total of fourteen genes, was spliced into the skin cells of an Asian elephant (Elephas maximus), the closest living relative to the extinct Woolly Mammoth. The results are promising with the altered skin cells functioning properly in their petri dish environment, but the scientists stress that cloning a viable Woolly Mammoth is still a very long way off. Scientists from Harvard Medical School are working on a number of genetic projects, including research into the Woolly Mammoth genome. They are however, competing against a number of other institutes including South Korea’s Sooam Biotech Research Foundation in a bid to extract viable DNA from a long dead animal with a view of investigating the possibility of cloning. The ancient genetic material was inserted into the cells using a complicated cut and splicing technique, an analogy would be to think of a film editor cutting and stitching snippets of film together so as to make a coherent movie. The system used was CRISPR (clustered regularly interspaced short palindromic repeat). Although this work has yet to be peer reviewed and no paper has been published describing the research in detail, preliminary findings suggest that the mutated cells are functioning normally. If this is the case, then this is the first time that Woolly Mammoth genetic material has functioned since the very last of these Ice Age creatures became extinct the best part of 4,000 years ago. 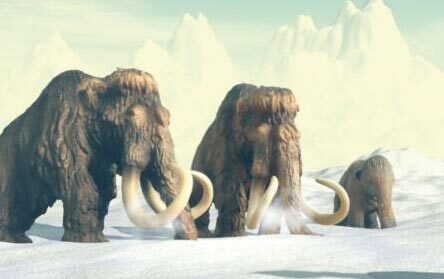 Having a established a thorough understanding of the Mammoth genome, the team focused on identifying and then adding to the elephant skin cells those genes which are responsible for the Mammoth’s adaptations to a cold climate, genes such as those for small ears, long body hair and thick layers of subcutaneous fat. Professor Church pointed out that they were a long way off from “Mammoth de-extinction”, despite some remarkable finds in recent years, including one amazingly well-preserved female Woolly Mammoth carcase, nick-named Buttercup, that was the subject of a number of cloning documentaries that aired recently. The genetics laboratory is the largest research facility at Harvard University and the researchers have been responsible for a number of important genome studies in recent years. Much of the team’s work involves studying the human genome as well as working on how to manipulate the genes of mosquitoes to help fight the spread of malaria and other diseases such as dengue fever. Splicing the DNA into the skin cells of Asian elephants is only the first step in, what will be a very long process. The next hurdle is to find a way of turning the hybrid cells into specialised tissues, to see if they produce the correct traits and characteristics. For example, will the genes for small ears, actually produce ears that are small and able to lose less heat. With animal rights groups preventing the use of elephants as surrogate mothers, hybrid cells will have to be adapt to being grown in an artificial womb. If a viable embryo is created, then it is a case of being able to bring that embryo to term and to produce a viable offspring. If all this goes to plan and cold-adapted, hybrid elephants are produced then more and more Mammoth DNA can be introduced into subsequent generations to drive out the Asian elephant traits. The Harvard team hope to genetically engineer an elephant that can survive in inhospitable, sparsely populated habitats, where such creatures would face fewer threats from humans. A long term aim would be to develop herds of Woolly Mammoths, once more roaming the steppes of the northern hemisphere. Team members at Everything Dinosaur wait to read more about this research and to see the peer reviewed comments, although we have made a wager that by 2045, a viable Woolly Mammoth will be produced somewhere in the world. Just thirty years to go then. Earlier this month, a team member from Everything Dinosaur visited Southglade Primary School to deliver a dinosaur workshop in support of Year two’s study topic all about dinosaurs. As part of our follow up support for the teaching team, we discussed extension ideas and emailed over further resources to assist the enthusiastic teachers with their scheme of work. One of the things discussed was to encourage the children with their writing by asking them to write a thank you letter to Everything Dinosaur. Sure enough, a couple of days ago we received a big envelope from Mrs Hyland containing a super set of letters. We have enjoyed reading them all and we have posted them up onto a notice board in our warehouse. What a Lot of Thank You Letters we Received! Year 2 pupils send in thank you letters to Everything Dinosaur. The children had taken great care in how they laid out their letters. There was lots of proper addressing on display, some super, clear writing as well as effective use of punctuation. Many of the children had incorporated some amazing vocabulary as well, words like “appreciate” and “sincerely” occasionally trip us up, so to see them used in a letter from a seven year old and spelled correctly too was fantastic! Thank you note from Alina. Keira, Aiden, Ella, Amr, Joy and Theo liked looking at the fossil teeth best, whilst Jude, Alex, Grace and Ewan enjoyed learning all about Triceratops. For Tyler and Lexi-Mai they were delighted to hear all about Tylosaurus and Lexivosaurus, prehistoric animals that have names that are like their own. A thank you letter from Year 2. Jayden, the other little boy called Theo, Milly, Kai and Demi-Lea all wanted to know whether Everything Dinosaur will be coming back to their school to teach about dinosaurs and fossils. Ezekiel, Gracie-Jai, Amira and Shantel asked how our dinosaur expert came to know so much about dinosaurs? That’s easy, he had a really enthusiastic teacher at school just like the children in Year 2. Portugal may have earned a deserved reputation for being the Jurassic dinosaur fossil capital of Europe, but more ancient sediments provide equally fascinating insights into life on our planet just as the Dinosauria were beginning to diversify and dominate terrestrial ecosystems. Step forward (or more appropriately waddle forward), Metoposaurus algarvensis a new species added to the Metoposaurus genus described from a bone bed found in the Algarve region of southern Portugal. A team of international scientists which include Dr. Steve Brusatte (University of Edinburgh) and J. Sébastien Steyer (Centre de Recherches en Paléobiodiversité et Paléoenvironnements, Paris), Dr.Richard Butler (Birmingham University) and Professor Octávio Mateus (Museu da Lourinhã, Portugal) have been studying the fossilised remains of several individuals that apparently died together when their lake dried up. Two metre long amphibious predator. Metoposaurid fossils are known from Europe, Africa, North America and India, although this is the first time fossils relating to this genus have been discovered in the Iberian peninsula. Some of the fossil specimens indicate that these amphibians reached lengths in excess of two metres and the shape of the skull along with other anatomical differences between the Portuguese fossils and other material known from Poland and Germany has permitted a new species to be erected. The bone bed that contains the remains of numerous individuals, ten skulls have been excavated so far, was discovered more than thirty years ago, but not properly mapped and explored until 2009 when the dig site was relocated. Although, these predators superficially resemble a modern salamander, scientists debate whether the Order Temnospondyli which the metoposaurids are part of, are actually closely related to extant amphibians. Scientists carefully extract blocks containing fossil material. Although the mouth was large and lined with many sharp teeth, the thick-set body was supported by relatively weak limbs. It is very likely that M. algarvensis spent a great deal of time in water, the fossils of these large amphibians are associated with strata laid down in lake or river environments (lacustrine and fluvial environments). These animals were probably ambush predators catching fish with rapid movements of their large mouths from side to side. They may also have ambushed unsuspecting small creatures, even some small early dinosaurs as these animals came down to the waters edge to drink. They would have been very capable swimmers but the small legs would have made movement on land rather clumsy and awkward. Three European species of Metoposaurus have now been described (M. diagnosticus from Germany, M. krasiejowensis from Poland and M. algarvensis from Portugal). Some of the German fossil specimens indicate amphibians approaching 3 metres in length, however, the majority of the Temnospondyls became extinct by the end of the Triassic. The Portuguese bone bed evidence further supports the theory that these large animals were confined to very wet habitats with lots of freshwater and therefore the sort of areas that these creatures could live in was much more restricted when compared to the rapidly evolving reptiles such as the crocodiles and the Dinosauria. As an Order, the Temnospondyls probably evolved sometime in the early Carboniferous and their fossils represent some of the most widely distributed terrestrial fossils recorded in Permian/Triassic strata. Their global range seems to have been limited to low latitudes during the Middle to Late Triassic, a distribution similar to but not identical to the Phytosaurs (crocodile-like reptiles that most probably become extinct at the end of the Triassic). Phytosaurs are Archosauriforms and provide plenty of evidence that the long-snouted, fish grabbing, swimming predator form has evolved in lots of different types of animal over the course of the history of our planet. Their more primitive ankle configuration (when compared to extant crocodiles), did not prevent the Phytosaurs from evolving into a myriad of different forms. However, apart from some controversial fossils, which most scientists claim are Late Triassic and not Early Jurassic the Phytosaurs along with most of the Temnospondyls were extinct by around 200 million years ago. However, viewers of the seminal television series “Walking with Dinosaurs” will remember that in programme five “Spirits of the Silent Forest”, which focused on life in the southern polar regions around 106 million years ago, a Koolasuchus makes an appearance. Two fossil jaws found in Victoria, Australia suggest that at least one type of Temnospondyl survived into the Cretaceous. One of the very first editions of arguably one of the most significant maps in the history of the study of our planet has been re-discovered. A pristine copy of William Smith’s 1815 map of the geology of England, Wales and parts of Scotland has been found in the archives of the Geological Society (London). It seems that the map was placed in storage, carefully sealed inside a leather wallet but just where in the vast archive it was stored had not been recorded. Ironic really, when you consider the dedication and attention to detail shown by Smith, the son of a blacksmith who so meticulously mapped the strata of most of the British Isles. The archives of the Geological Society are vast, after all, it is the oldest body of its kind in the world (founded in 1807). This year marks the bicentenary of the publication of William Smith’s great geological survey, only about 370 or thereabouts were ever produced and with this re-discovery, it is estimated that at least seventy are still in existence, not bad considering this map first went into production in the same year as the battle of Waterloo. It is believed that this particular copy last saw the light of day around forty years ago. It is thought that William Smith, nick-named “strata-Smith” by his contemporaries spent fifteen years travelling the United Kingdom and carefully recording the rock formations exposed on the surface of the land. His map when published, helped land owners and mining companies exploit this nation’s natural resources as the map helped surveyors identify potential areas for drainage, sites for new building work and most importantly which layers of strata indicated the presence of coal seams nearby. Having been hidden away in the archives the map, which was printed from copper plate engravings with the details painted in with water colours, has not faded and the colours depicted are as vivid today as when the map was first completed. Archivists are puzzling over just what number in the sequence of maps produced might this copy be? There is the exquisite hand finished painting with the lower edge of each formation saturated and then the paint is faded to indicate the formation’s edge, a technique used by Smith to make his maps easier to read, but the map itself, unlike later editions, has no serial number. Geologists are aware that the very first maps produced were not numbered. Another clue as to just when this map was made can be seen in how the geology of the Isle of Wight is depicted. Over the production period of Smith’s map, the way in which the geology of the Isle of Wight was shown changed several times. This map shows a very early effort to map the geology of the island. All this suggests that this particular example of cartography might be amongst the first dozen or so ever produced. The Isle of Wight illustrations suggests an early print. The Geological Society has had the map fully restored and digitised. As from today, it will be available to view on line on the Geological Society’s website. This copy of the map itself will be stored back in the archives, this time properly catalogued. A paper copy of the “Smith map” will be put on display in Burlington House, (London) the home of the Geological Society. Now, we at Everything Dinosaur don’t want to be cynical but today, March 23rd, is the anniversary of the birth of William Smith. He was born on this day in 1769 in the county of Oxfordshire. We think the timing of this announcement regarding the re-discovery has a lot to do with publicising an event taking place later on today, when Sir David Attenborough will be unveiling a plaque in tribute to the “Father of English Geology” at his former London residence – 15 Buckingham Street. During his life, as William Smith strived to forge a reputation amongst academics, his lowly beginnings as the son of a blacksmith meant that his views and findings were often disregarded by those who perceived themselves to be of a higher class. Class distinctions blighted the lives of many pioneers in geology and palaeontology during the Georgian and Victorian times. However, William Smith and his contribution to our understanding of the world is now recognised and his map of England, Wales and parts of Scotland remains one of the most significant maps ever produced. Why was the Map So Important? Smith explored the deep excavations taking place as canals and other major works were being constructed and found that he could correlate apparently dissimilar and geographically dispersed strata based on the fact that they contained similar fossils. Going up through the strata, William Smith observed a succession of different fossils and proposed that each stage of this succession represented a specific period in the history of the Earth. This is termed the “principle of faunal succession”. In this way, the relative age of rocks could be determined and the types of fossils that characterise strata led to the concept of biostratigraphy. Smith developed and built on the idea of a Law of Superposition, postulated by the great scientist Nicolas (sometimes spelled as Nicolaus), Steno in the 17th Century. Can you see the geology in your part of the world? Originally produced as a map in fifteen sheet sections, the geological map of the British Isles (most of it) measures approximately 180 cm by 250 cm. We at Everything Dinosaur, don’t know why northern Scotland was not mapped by Smith, we suspect it was much more difficult to travel the highlands and islands of northern Scotland and during the early 19th Century, there was simply not the demand for detailed geological maps of that part of the British Isles. The low tides brought about as a result of the spring equinox has exposed a remarkable series of Early Jurassic trace fossils, giving residents of the town of Talmont-Saint-Hilaire the chance to go “Walking with Dinosaurs”. The exceptional low tides on France’s North Atlantic coast have revealed 200 million year old footprints as well as ripple marks preserved in the mudstone and sandstone which were laid down at the very beginning of the Jurassic (Hettangian faunal stage). The site represents an estuary, or shallow bay area and this was criss-crossed by many different types of dinosaurs. Hundreds of footprints have been recorded, a large number have been removed to prevent further damage by erosion, but at very low tides, especially in the spring when the seaweed and algae growth is not extensive, many three-toed prints can still be seen. The site was discovered in 1963 by a local engineer and chemist Gilbert Bessonnat, but it was not until March 1965 when a team of French palaeontologists mapped the area in earnest that the full significance of the location was revealed. The mapping project begun on March 19th that year, taking advantage of the very low tide associated with the spring equinox, allowed the scientists to discover what has turned out to be the largest single concentration of dinosaur ichnofauna in the whole of France. Dinosaur trace fossils from the Lower Jurassic are exceptionally rare, the site is protected and no fossil collecting is allowed. After all, the sandstones and mudstones preserved here record terrestrial life shortly after the End Triassic extinction event, those footprints were made some fifty million years before the likes of Stegosaurus and Diplodocus and other iconic Jurassic dinosaurs roamed the Earth. In all, about a dozen different ichnospecies have been identified, including large and small Theropods. Some footprints may not represent dinosaurs, for example, some trace fossils have been assigned to the Order Rauisuchia and ascribed to the Postosuchus genus (a type of ancient, terrestrial Crocodylomorph). Ichnospecies associated with the site include: Eubrontes veillonensis tentatively described as a Megalosaur, Talmontopus tersi which could be a bipedal Ornithischian dinosaur and several dinosaurs assigned to the coelophysids (ichnogenus Grallator). It seems that low tides on the North Atlantic coast of France, are providing scientists with a unique opportunity to learn about life in the Early Jurassic, well at least over the spring and autumn equinox anyway. This print has been assigned to the ichnospecies Eubrontes.